For decades, scientists who study hurricanes, whirlpools and other large fluid vortices have puzzled over precisely how these vast swirling masses of gas or liquid sustain themselves. How do they acquire the energy to keep moving? The most common theory sounded like it was lifted from Wall Street: The large vortices collect power as smaller vortices merge and combine their assets, in the same way that small companies join forces to create a mega-corporation. But researchers from The Johns Hopkins University and Los Alamos National Laboratory now believe the better model is a much different business tactic: the hostile takeover. Working with theoretical analysis, computer simulations and lab experiments, the team has concluded that large fluid vortices raid their smaller neighbors in an energy grab and then leave their depleted victims either to wither away or to renew their resources by draining still smaller vortices. The findings were published in the March 3 issue of the journal Physical Review Letters. "This discovery is important because it could lead to a better understanding of how hurricanes and large ocean eddies form," said Shiyi Chen, an author of the paper. "It should also help us to create better computer models to make more accurate predictions about these conditions." 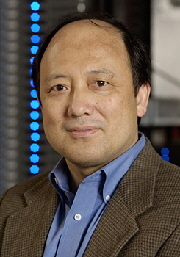 Chen is a professor in the Department of Mechanical Engineering at Johns Hopkins, where he occupies the Alonzo G. Decker Jr. Chair in Engineering and Science. 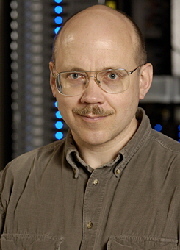 He supervised the computer simulations in this two-and-a-half-year research project. The team looked at large energetic vortex structures that form in irregular or turbulent two-dimensional flows of gas or liquid. Common examples are the Red Spot on Jupiter and hurricanes or typhoons on Earth. The researchers wanted to figure out how energy is transferred from smaller vortices to these large-scale circulation patterns. The basic phenomenon, called "inverse energy cascade," was predicted almost 40 years ago by pioneering turbulence theorist Robert H. Kraichnan. However, the dynamical mechanism underlying the inverse cascade has remained obscure. Does it occur, as some scientists suggested, through a merger of small vortices to form a new larger one? "We went into this with an open mind, but we found that the popular idea of mergers was not correct," said Gregory Eyink, a Johns Hopkins professor of applied mathematics and statistics and currently the 2006 Ulam Scholar at Los Alamos Laboratory's Center for Nonlinear Studies. He served as the primary theorist in the project and was an author of the journal article. "We found that such mergers are very rare." He said the energy transfer actually occurs through a process described as a "thinning mechanism." "You have a large vortex spinning around, with a smaller one inside," Eyink said. "The large vortex has a shearing effect on the smaller one, like cake batter being stirred. The large-scale vortex acts like a giant mixer, stretching and thinning out the smaller one, transferring its energy into the larger vortex. The large-scale vortex actually acts like a vampire, sucking the energy out of the smaller one." This phenomenon sustains a steady-state inverse energy cascade. "We end up with a group of large predator vortices preying on smaller ones, which in turn prey on smaller ones still, forming a food-chain of vortices," Eyink said. Johns Hopkins researchers used these banks of computer servers to produce simulations for their research into how large fluid vortices, such as hurricanes, acquire energy to sustain themselves. From left are Minping Wan, a graduate student in the Department of Mechanical Engineering; Gregory Eyink, a professor in the Department of Applied Mathematics and Statistics; and Shiyi Chen, a professor in the Department of Mechanical Engineering. Through computer modeling at Johns Hopkins and laboratory experiments at Los Alamos on thin salt-water layers, the scientists were able to observe the physical processes and measure the energy transfer. This confirmed their theory that an energy transfer by stretching of small-scale vortices is what sustains large-scale vortices. "This is the first time a quantitative connection has been made between the process of vortex-thinning and inverse energy cascade," said Robert Ecke, director of the Center for Nonlinear Studies at Los Alamos, an author of the journal article and supervisor of the lab experiments. The team's research was supported by grants from the National Science Foundation and the U.S. Department of Energy. Co-authors include Michael Rivera of the Los Alamos Materials Science and Technology Division; and Minping Wan and Zuoili Xiao, both graduate students in the Department of Mechanical Engineering at Johns Hopkins. Color images of the Johns Hopkins researchers available; contact Phil Sneiderman.